Looking at your options for dentures Colorado Springs area residents? You Have Choices! When George Washington was inaugurated as the first president of the United States, he didn’t have many options for his toothless condition. In 1775 he incurred bills for $500 (the equivalent of $25,000 in today’s dollars) for what is assumed to be dental treatment and perhaps his first set of dentures. 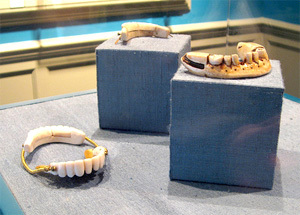 We do know that John Greenwood made four sets of dentures for George Washington. Pictured here are the teeth he wore. They were made of hippopotamus ivory and set with human teeth. Washington expressed problems with all of them. Not all dentures are created equal, and you may be surprised to discover just how much variety and wide the range in quality and prices can be. For dentures Colorado Springs community members trust and feel good about wearing and using, they go to Northgate Dental. Here, we use dentures as the last option, as we believe investing in your real teeth is the best solution if at all possible. However, for the patients that this is not an option, Dr. Carter provides a range options for dentures Colorado Springs and the surrounding areas can count on. With advanced techniques and superb skill, he can create dentures that look great and also are comfortable to wear. You don’t have to have just “plain old dentures,” we can work with you to create a look that will make you want to show off your smile again. Today you have quite a few more options than President Washington had! From partial dentures to full dentures, removable to fixed implants, we have all the options at Northgate Dental, and will teach you how to best care for your dentures so they last.